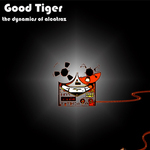 Good Tiger began as a lo-fi bedroom experiment in late 2005.Dave Holland,lead singer and guitarist with the funk/dance/lohi-fi group Blue Ghost started writing the songs that would eventually become the bands debut album using various cheap and cheerful musical instruments.Inspired by artists such as Beck,Wilco,Miles Davis,Aphex Twin,Bowie and the oblique strategies approach the aim was to write music that would affect and surprise but yet always capture the listener with melody and the offbeat lyrical approach he has always used in his music. In search of like minded individuals to bring the band to the stage and ultimately to add to the final album he linked up with Alan Montgomery,ex bass player with the now sadly defunct Revelino and Ger Cantwell,a precise powerhouse of a drummer with bands like Tophi,Gout and The 2 Fantastic 3. The three members have spent the early part of 2007 honing the songs into a formidable live experience and are now finalising the album"The Dynamics Of Alcatraz".The album is going to be released in late summer 2007.